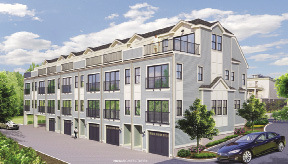 192 Pleasant St., currently under construction, is a new riverfront residential community and has already attracted significant interest by potential home buyers. Located along the Charles River, the development is in the easternmost part of the Pleasant St. corridor district, less than half a mile west of the heart of Watertown Sq. The property abuts Massachusetts Department of Conservation and Recreation park land and the Charles River Bike Path. Residents will have direct connection to these unique waterfront amenities. 192 Pleasant St. consists of three story townhouses each with a combined open plan kitchen, dining and living room; three bedrooms, three full baths, a powder room and a spacious private roof-top deck overlooking the Charles River. Also included is a garage space for two cars below each of the seven units. HDS Architecture of Cambridge, known for high profile residential design is the project architect. Hans Strauch, principal-in-charge, said, "Our goal was to take full advantage of the property's proximity to the Charles River by designing spacious units with large glass openings and views connecting the interior spaces to the natural environment. 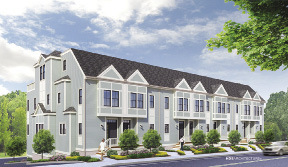 The Watertown planning board appreciated the scale, size, and design of the townhouse project. Rather than turning its back to Pleasant Street, the townhouse development has welcoming facades with front doors and porches." JW Construction of Cambridge is the general contractor and is one of metro Boston's premier residential builders. The new townhomes will have high quality finishes including natural wood flooring, granite countertops, energy star appliances and high efficiency mechanical and plumbing systems. Jon Wardwell, owner of JW Construction, said, "We are applying the same level of craftsmanship, quality and detail to these new homes that we apply to our build-to-suit customized houses." Landmark Real Estate of Belmont is the broker for the development. William Dillon of Landmark said, "Having identified this property as a residential development opportunity, it is exciting now to see it become a reality. Already there is significant interest. It is rare to have such large townhomes with two covered parking spaces right along the Charles River. We anticipate that sales will move quickly." Construction is well underway with completion projected by mid-January, 2015. General Contractor: JW Construction, Inc.